India’s burgeoning logistics sector is gaining favor with property developers and investors, boosted by a growing consumer class’s embrace of online shopping. With the nation’s residential market in the doldrums and good quality office space in short supply, logistics assets are attracting global players such as Brookfield Asset Management Inc., Canada Pension Plan Investment Board and Warburg Pincus LLC. “India’s logistics sector is coming of age,” said Rushabh Desai, Asia-Pacific chief executive officer at Allianz Real Estate. The firm recently partnered with ESR Group for an initial $225 million investment targeting logistics properties in cities including Mumbai, Bangalore and Hyderabad, with a goal of growing to $1 billion in assets. The introduction last year of a uniform national goods and services tax, replacing a plethora of state and federal levies, has helped unify India’s 29 states into a single market. That’s brought a structural shift to the logistics sector as small, fragmented networks are consolidated into large distribution chains with centralized hubs. The rise of e-commerce giants Amazon Inc. and Flipkart Online Services Pvt. has also stoked the need for seamless, last-mile delivery of goods in cities and the country’s remote towns and villages. The explosive growth in online shopping is expected to give a further boost. The $35 billion e-commerce market is projected to grow 25 percent a year for the next five years and exceed $100 billion by 2022, according to a report by tech industry body Nasscom and PricewaterhouseCoopers. 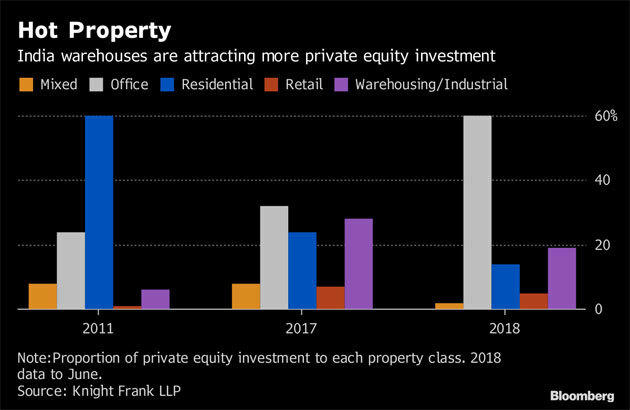 Warehouses accounted for about $3.4 billion, or 26 percent, of private equity real-estate investments between 2014 and 2017, according to Knight Frank LLP. Returns for a warehouse development can reach 28 percent, and exceed 20 percent in most major markets, according to Knight Frank estimates. The government has also given infrastructure status to the logistics industry, allowing developers to access lower-cost funding for developments. “Over the next decade, we envisage a potent mix of drivers to transform the large yet inefficient, logistics sector,” Alok Deshpande, an analyst at Edelweiss Securities Ltd., said in a note this week. The rosy outlook is even encouraging some developers to shift their focus from housing to warehouses. Panchshil Realty, which built one of India’s Trump-branded towers, is one. While it will complete existing residential projects, it won’t take on any new housing developments, and instead concentrate on logistics facilities and its existing hotel and office assets.